Aresco is proud to be a part of the U.S. oil renaissance with active projects and targeted prospect areas across Texas, Oklahoma, New Mexico, and throughout the Gulf Coast states including Louisiana and Mississippi. The map to the right highlights our current Areas Of Interest (AOI) in addition to the counties where we are currently active. Our portfolio includes both producing and non-producing assets through non-operated working interest positions with established lead Operating Partners. Together we are collectively pursuing new production and new field discoveries, establishing our base of proved reserves, and growing our drilling inventories in proved-producing oil and natural gas fields. When oil and gas was discovered in 1901 at the Spindletop Field in Beaumont, TX, the Gulf Coast Region changed the world, ushering in the modern oil industry that we know today. The Gulf Coast has turned out to be one of the best places in the world to find oil and gas. With upwards of 20,000 feet of stacked sediments beneath the coastal regions of Texas, Louisiana, Mississippi, and Alabama, the Gulf Coast has proven to have the right geology, temperature, and timing to create over 1.48 trillion barrels of oil and 153 quadrillion cubic feet of natural gas. The Woodbine Formation is the primary oil producing zone in the East Texas Oil Field, the second largest oil field in the United States outside of Alaska. Since its discovery in 1911, this field has produced more than 5.2 billion barrels of oil. Much like in Pennsylvania where the first oil well was drilled, Oklahoma has had natural oil seeps since before the significance of oil was known. It was not until 1889 that the first purposeful oil well was drilled, but this first step opened the door to many more. Exploration for oil and gas spread across hydrocarbon rich Anadarko, Arkoma and Ardmore Basins and Cherokee Platform. These regions of Oklahoma have produced more than 14.5 billion barrels of oil and 90 trillion cubic feet of gas since 1901. Louisiana has had an oil industry for more than 100 years, with the first successful oil and gas well completed in 1901 at Jennings, LA. The state has seen the full evolution of the industry, from the first rotary drilling rigs to the first steps offshore to find oil and gas. Over this time, more than 1.165 million wells have been drilled, producing 25.2 billion barrels of oil and 214 trillion cubic feet of gas. A massive hydrocarbon-producing region, the Permian Basin features a diverse combination of conventional and unconventional plays as well as multiple production horizons. The Permian has produced 29 billion barrels of oil and contains estimated recoverable reserves exceeding what has been produced over the last 90 years. The first oil discovery in New Mexico occurred in 1911, with the first big oil strike occurring in 1922 in the Hogsback Field. Both of these discoveries occurred in the San Juan Basin, the 2nd largest natural gas field in the United States which has produced over 1.3 trillion cubic feet of gas as of 2009. Along with the San Juan Basin, a portion of the prolific Permian Basin sits within New Mexico’s borders, housing more than 25,000 oil wells and 2 of the top 100 largest oil fields in the United States. With these two oil and gas producing regions, along with other smaller regions, New Mexico is the 6th largest supplier of energy to the nation. 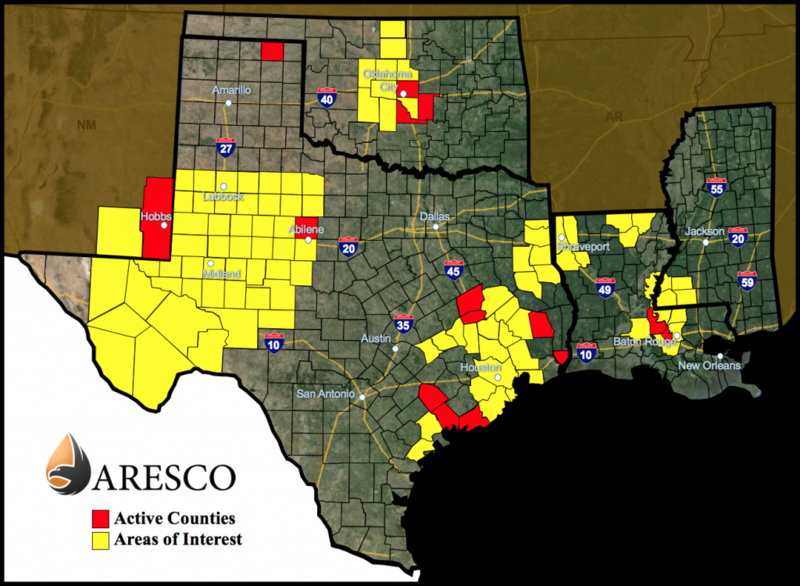 Aresco actively evaluates conventional and unconventional opportunities across the United States. We specifically seek high value targets that exhibit the potential to generate positive cash flow and overall growth through continued development. We have already expanded our portfolio into New Mexico, Oklahoma, Mississippi, and Louisiana, with eyes to continue our growth throughout the Gulf Coast region. Please contact us today for more information on current and/or future Oil & Gas production activities.